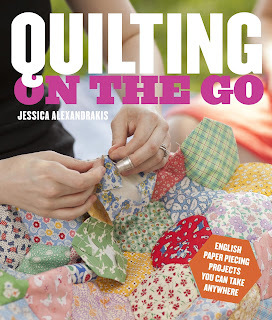 I am thrilled to be the one to kick off the blog tour for Jessica Alexandrakis' s book Quilting On the Go, published by Potter Craft in North America and Search Press elsewhere. This blog tour runs until June 21 at the blogs listed below. There are two chances to win a copy of this great book. Leave a comment on this post until June 15, with the winner announced on June 16, or visit Lucy at Charm About You from June 17-21. The book is filled with many time-saving tips and great ideas for organizing fabric and supplies for travel. I learned so much from watching the video that Jess made, one handed (holding her baby with the other), a long time ago, and all those helpful suggestions are in the book. I used the plastic Quilt Patis templates for my diamond EPP projects, but another great option is the precut paper templates from Paper Pieces. If you want to try these, it's a good time to do so, because they are offering 20% off your entire shopping cart, no minimum purchase, with the code UNDER20, during the blog tour. Jess asked me to show some photos of other EPP projects I've been working on, and it's good timing to show the finished quilt top of this rose star project that I started about a year and a half ago. I jumped on the bandwagon that Clare at Selfsewn was leading at the time, and I loved making every single block. I'm not generally a fussy cutter, but this time I did fussy cut all the centre hexagons. This one with the Lizzie House fox is my very favourite. I just have to decide how to deal with the edges of this quilt. I could make a few half stars to even out the edges - it will either be that or applique the edges onto a wider border. I wasn't entirely sure about that Ghastlies fabric as a background at first, but I do think it is a good choice - it has a bit of action, but not so much that it competes with the stars. I've got the fabric cut diamonds for the whole project in the larger zip bag, and basted diamonds in the smaller bag. I have a larger pair of scissors in my checked bag, but these tiny Gingher snips meet TSA specs, although I have often had my carry-on gear inspected once they see them in the x-ray. I once posted about how I hated that Clover desktop threader, but I realized that I was using the wrong needles. If you use round eye needles, it works a treat, and I couldn't live without it. It's a bit bulky for traveling, but I do love it that much now. Here's how that project looks now. It's only going to be a little mini - I wanted to try working with those Oakshott cottons. The depth and play of the colours don't show up so well in these photos - they are amazing to work with and to see in person. Just one warning about flying with EPP: be careful during turbulence. As I mentioned, I don't like flying, but I do find that hand stitching gives me something besides crashing to think about and calms me down. One time we hit a patch of turbulence and as I was drawing the thread through, I poked myself in the cheek with the needle! So use caution! Congratulations, Jess, on producing a great book, and thanks for allowing me to be part of it! To enter the giveaway, please leave a comment below telling me about your experience with EPP. The comment thread will be closed the evening of June 15, and I will select the winner on June 16. If you don't win, be sure to go visit Lucy June 17-21 for another chance! Edited to add: if you can't find the comment box, you may not be at the permalinked page for this post. Go here, and it should be there for you. June 16 update: The giveaway is now closed and the winner will be announced shortly - good luck, everyone! This looks like a great book! Thanks for the chance to win! I just received some of the practice little packs for EPP and I only have done 6 so I guess I am kind of new at it but so far I am liking it very much. And then when I see all these beautiful quilts made with them it inspires me to really continue on. So thanks for the inspiration and a chance to win a book that I could surely use even for the organizational part of it along with the beautiful projects. Ah ha! that's better, thankyou Lesly! I love to EPP. I started years ago, when we had a caravan and I wanted to sew on our trips. I started a craft group which meets fortnightly in oneanothers homes. EPP is perfect to take along to our meetings. I recently finished a lozenge quilt and showed some friends how to make them, so there are several being made and we share scraps so that each of us includes a little of our friend in our quilt. I have an EPP in progress for about three years--maybe it's time for the big push! I'd love a chance to win! I've never tried EPP but it's high time I do. I'll be travelling a bit with work this summer, and a hand project would be a great way to keep quilting. I haven't joined the EPP bandwagon, but this book looks like it would help me overcome my fear of all those little pieces. thanks for the chance. EPP ... Oh how I love thee. lol I would love to read the tips on travelling with my projects b/c I tend to feel overwhelmed with all of the bits it takes to take it with me. Thanks for the chance to win! Lovely lovely projects you have there! thanks for sharing! I would love to win this! I just started EPP last month and have gotten halfway brought a table runner! It is so much fun to do! This looks like fun. EPP is one of favorite things to do while traveling. 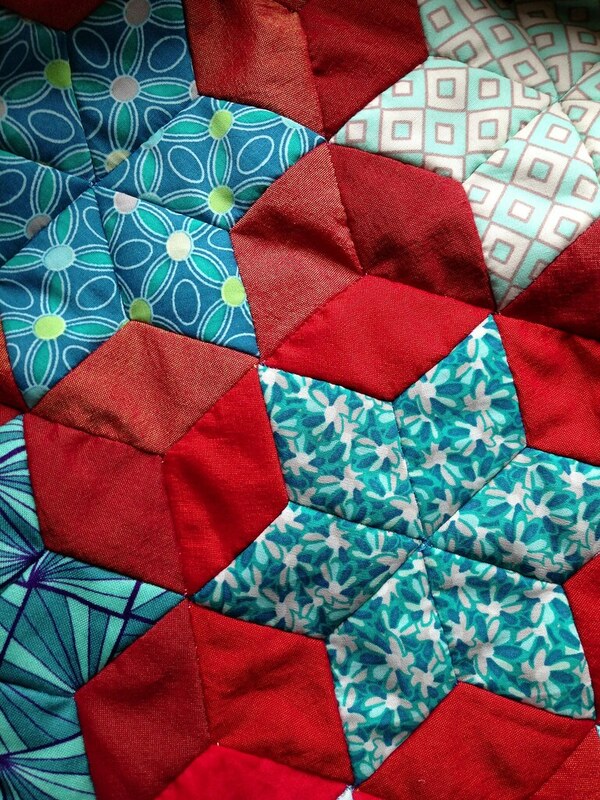 I spent all of 2012 piecing blocks for a big EPP rose star quilt with Clare at Selfsewn. It's now nearly complete with the hand quilting all I need is to finish off the edges and bind it. Looking at your finished top, or almost finished top makes me happy to see others got inspired and made big quilts too. Seemed like the flickr. group was working mostly small baby sized quilts. Mine is going to fit a queen sized bed. I am almost ready to begin a new epp project. 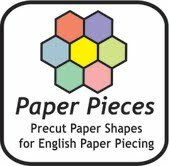 Thanks for the discount code for the paper pieces that is encouraging. Last time I cut them myself out of old envelopes. EPP is such a tame name for such a dazzling technique. Those little chips of color, those little geometric snippets create a kaleidoscope delight for the eye don't they? Wow!! Last year I mailed my sister a little envelope of paper templates and fabric squares and then held my breath. I was so happy when she took to it like a duck to water. Thanks for the great pictures. Wow!! Oh I made a grannyflower quilt which I really love, but still has to be quilted. Great book and I looove your quilts, just beautiful!!! I loooooove, truly looooove your quilt. Perfect in every way. I love EPP & love your quilt. I have been working on a hexagon charm quilt for about 3 years now. I have the book on my wishlist and would love to win a copy! 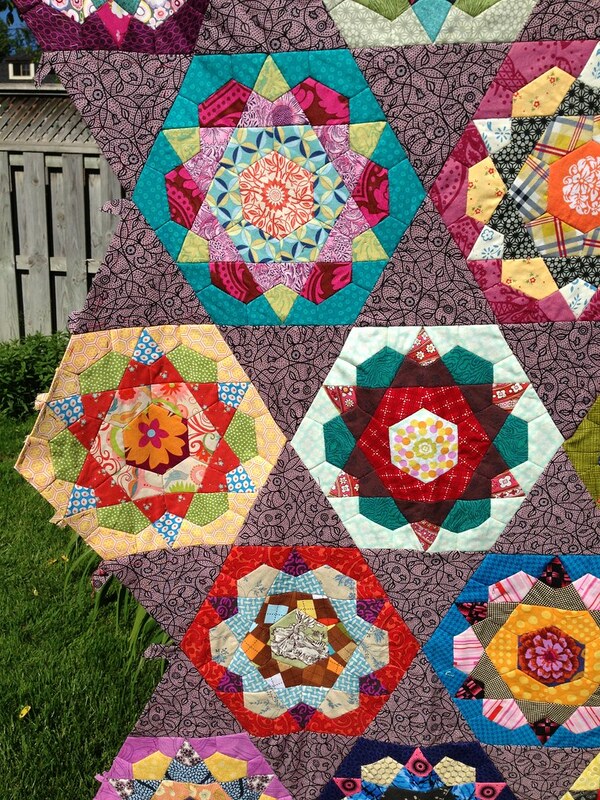 Lovely projects, I'm really tempted to try such a star quilt one day. And the fussy cut centres in the rose stars are such fun, the fox is my very favourite too. I only used EPP for one mug rug a some little hexies embellishment for a bag but I enjoyed the experience very much. I'd love to win the book. I've already collected a box of squares and hexie paper pieces, however, I'm a little intimidated. I haven't started the project yet. Thanks for a chance to win such a great book. Fantastic post! I am just hitching myself to this new bandwagon. I have never tried EPP, but want to. I need something to do while watching TV. I usually take embroidery with me on road trips but have recently gotten into quilting. This is perfect for those trips. Love your EPP quilts, haven't really done much of it myself just yet but can't wait to try! thanks for sharing. I have just started a EPP hexagon quilt to take as I sit at many of my kids summer activities. Lesly, your "bandwagon" quilt is outstanding! Great choice of background fabric. I was just reading a bit of advice that "purple goes with everything", and your plummy Ghastlies fabric proves that, I think. Time for me to dig out my paper-piecing kit and get busy again. Lovely work! I've only just started my own EPP project,... 1/2" hexies. And I am loving it! I know, it's going to take a long time, but it's all for me and I don't care how long it takes. I take it lots of places and am amazed at how quickly the units do work up. I just need a LOT of them, hehehehe! Just think of all the different fabrics people will be fascinated with in 100 years! I am halfway through piecing an EPP hexie quilt and eyeing up fabric for a star quilt, this book would be heavenly to own. I have never tried EPP, but your lovely quilt are inspiring me! What a great travel project! This past winter I started a EPP project. I love doing the hand sewing. I took othe train to Seattle,Wa and it was a great project to take along. It would be great to win this wonderful book. I love EPP. I have a number of EPP projects started right now, and am contemplating teaching a class on it. I would so love to win this book! I've been looking at it since I first saw it at Life Under Quilts. It looks like a fun book! I love hexagons as a travel project. I think it would be great to try out some other shapes and this looks like great inspiration. Thank you for this opportunity. I have been wanting to try EPP for a while. Seeing your wondeful EPP work just makes me want to give it a try now! I would love to wing this book! I inherited a stack of GFG blocks and pieces, but the seams were 1/8"! 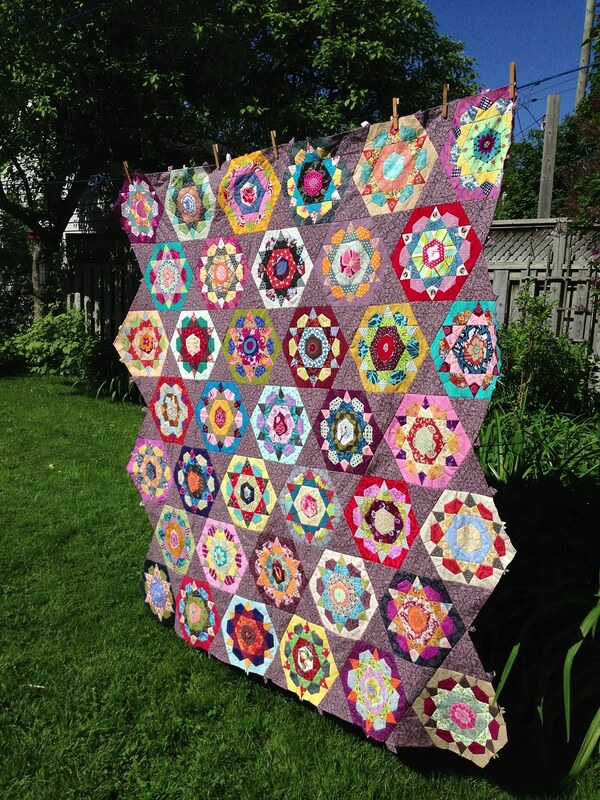 I want to learn EPP so I can recreate this terrific family quilt from similar fabrics. Thanks for holding the drawing, I've been following Jess's blog for years! 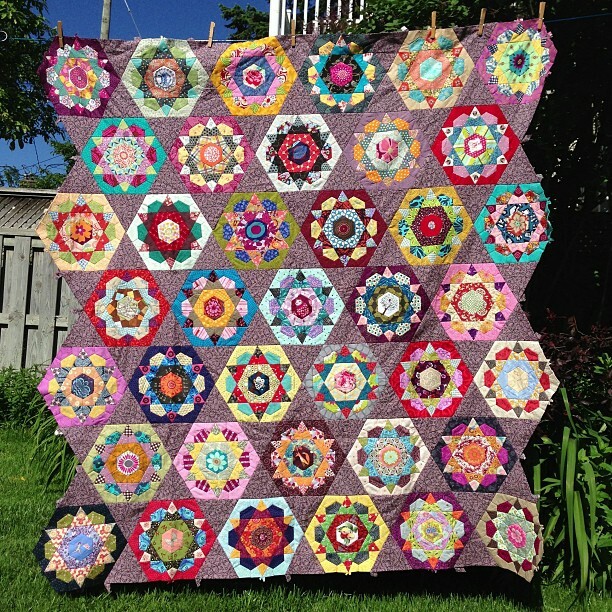 beautiful quilts - thanks for sharing and for the chance to win a great looking book. I have only recently started a little bit of EPP using hexies and am loving it. I have done a fair bit of hand piecing in the past though. Beautiful rose star! I'd add some half stars to the edges if I were you ;) And my experience is fairly limited so I would love to get my hands on a copy of this book! Your quilts are beautiful!. I've just started EPP with diamonds, great aren't they! Awww such beautiful quilts! I´d love a chance to win! Love doing stitching on the go though for me it has been the kids going somewhere and me waiting for them! I would love to have a chance to win. Living aboard means I can't get my hands on it for a very long time. I've only just started EPP, but am hooked. I'm making 6 pointed stars with the hope it will become a lap sized quilt. I really enjoy sitting in front of the telly at night and stitching. yes, there is something soothing about EPP, I don't do enough of it really! Good luck to everyone, anyway ! Congrats also for your gorgeous own quilts, they're awesome ! I'd love to win this book as I need new ideas for EPP projects. I've only used hexagons and diamonds, but I'm sure there must be other shapes I could try. Your mini star quilt is so pretty. Love your color choices! Thanks for the chance to win a copy of the book. I love EPP! Thanks for the chance to win! Your quilts are so pretty! I have just started EPP. I thoroughly enjoy it. I even joined a hexie bee. I started to do an EPP project on my way South last winter. What a great past time while my hubby drives. Thanks for the chance to win this great book. My first EPP projects were hexagons for baby quilts, and then a couple of years ago, Jessica's blog inspired me to try diamonds, which I'm loving. I've done a few square-triangle-hexagon combinations, too, which have been fun. I am currently working on a EPP Hexie Baby Quilt as a gift for a friend and her first born. I AM IN LOVE WITH EPP! It is so relaxing and I love being able to take it with me. It is so rewarding, too! I've only used hexagons but I'd love to try other shapes! Your work is fabulous! I have a Grandmothers Flower Garden that is still a UFO and I really need to tend to it. EPP is so portable that's its easy to get hooked. I have a centerpiece that I did as part of a QAL. Its sandwiched and ready to be quilted. I just can't decide how to quilt it. Maybe the book will give me some ideas, I can only hope! I love your quilts. You are doing an awesome job with your selection of colors and textures. Wonderful giveaway! I remember your post of the quilt in the book--so lovely! The other quilts you are working on are absolutely fabulous. Love the colors you use esp. I would love to win this book. Alex got me totally hooked on EPP! I got so hooked on EPP while looking around at other quilters blogs. I have never been one to like to hand sew so I was so surprised how much I love epp. It is so relaxing to me. I do it a lot in the evening while watching TV. I am working on a grandmothers flower garden and have made many Christmas ornaments with EPP. Thank you for the chance to win this book. The photos are awesome for this book! I haven't tried EPP yet, but I did buy the paper templates at a quilt show I went to. I would love to win this book for more information and inspiration. They're really beautiful quilts - I love your first one, but the Rose Star one is extra lovely. Off to look at the Book on Amazon! I would love to win a copy of the book. Thanks for a chance! I may have to buy it. Don't know if I can wait! I love EPP. I like taking it on the ferry to go shopping (I live on an island!) Your quilts look great ! This looks like a great book. Thanks for the chance!! I love EPP. Thanks for the chance to win this great book! I love EPP. I would really love to win a copy of this wonderful book. I need more inspiration to get my needle and thread moving. The only EPP I have done is with Hexagons. I so want to learn how to do other patterns. The quilt on the bed is gorgeous! Thank you for the chance at winning this awesome book! Have not tried EPP. Do not like the look of hexies, but I love stars so EPP may be more my thing. 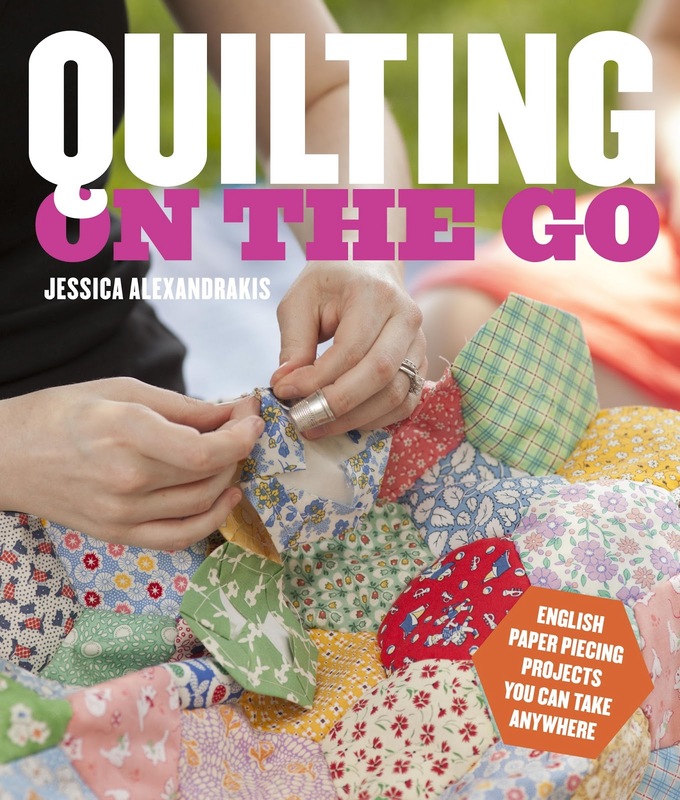 Have not been quilting for long and piecing is my current skill level, although I love to try new things and this book looks very interesting. I just started EPP and I am hooked. I have done a couple hexie projects. I am just starting my first EPP project and.would love to win the book. Love your quilts by the way. I may have to try a star quilt! I have done EPP with hexagons, but just bought some 60-degree diamonds to try some stars - loving it so far. Thanks for the chance to win - this book looks amazing - and your star rose quilt is so inspiring! I have only made small Christmas ornaments with EPP, but I love the portability of this technique. I am going on a cruise this summer and I could easily keep my hands busy on the flight across the country to get to the ship. I would love to win this book for inspiration. I love hand piecing. Thanks for sharing your quilt. Beautiful. I am in a EPP bee and have done a few hexagon projects for myself. And I thought it was all just hexagons! Thanks for the giveaway! I would love to win this book and give epp a try. Thanks for the giveaway! I haven't tried EPP yet ... it's on my list this year. HELLO! WHAT A GREAT POST! LOVE TO BE ENTERED TO WIN THE BOOK! I have done very little EPP and would love to do more! 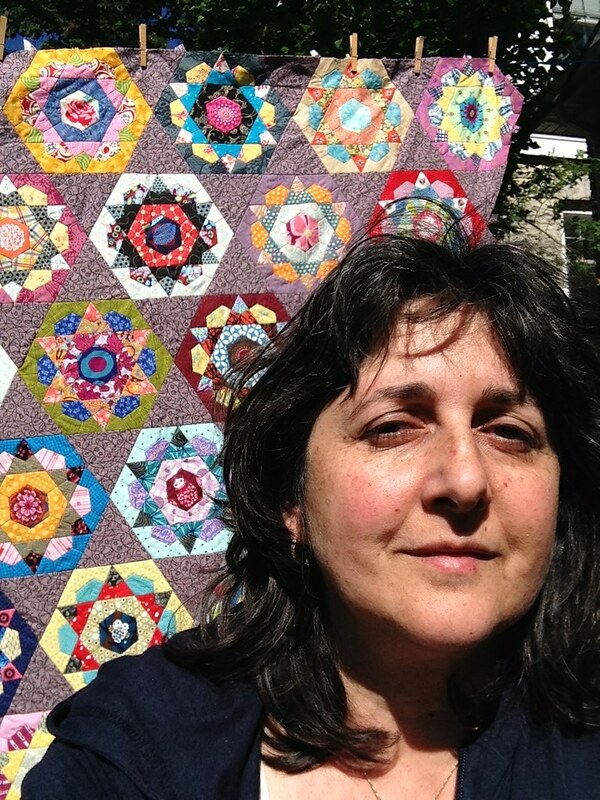 Your quilts are certainly inspiration! I am have been EPP for a very long time, but have very little to show for it. I have pulled out my hexies and I am going to get on the ball. I see so many cute things out there that I want to start. Thanks for sharing! I learned to EPP from my elderly neighbor and every time I bring out my pieces I am filled with such warm memories of her! It so nice to see a new book on the subject! I hope I win thanks for the opportunity! 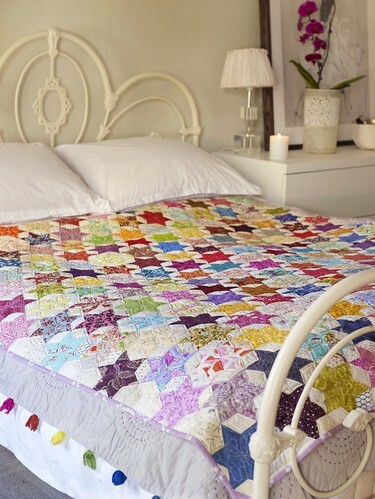 I need to learn how to do this - beautiful quilts! Love the idea of having something to do while trabelling. I have no experience with EPP really, other than one trial block years ago. But...that said, I've always wanted to try again. Especially after seeing all of the beautiful photos you ladies have been posting about! I love paper piecing and this looks like a great book. Thanks for the giveaway! I am attempting an EPP triangle shaped project right now, but I am not sure what to do with it. I am sure the book will give me some ideas! What a great post. Looks like a fabulous book. I would love to learn how to EPP! I love the way EPP looks, love the portability of it, have all the supplies to do it...but I haven't done it yet!! My hands and wrists give me fits with carpal tunnel so I need to be very careful with how much handwork I do. I'm working on my first EPP project! Two inch hexagons, and I'm trying to use fun, special prints, kind of like an adult, girly I spy quilt. I'm learning as I go along. I have made a few EPP hexagons that really need sewing together, just haven't decided how! genius idea. If I'm not lucky enough to win it may have to go on my christmas list! I'd love to try EPP. The idea of a project on the go is so appealing. Thanks for the giveaway! I love your quilts, I've only just started EPP. I'm thinking pillow for now! Funny! I thought I had a new idea, getting my EPP project ready for my 20 something hours to China to visit my daughter and family last month. I used a cosmetic bag from Vera Bradley, with different compartments for the three shapes I was working on. My project was the Star Blossom tablerunner from Rachel Hauser. It was a great project to have on the plane! 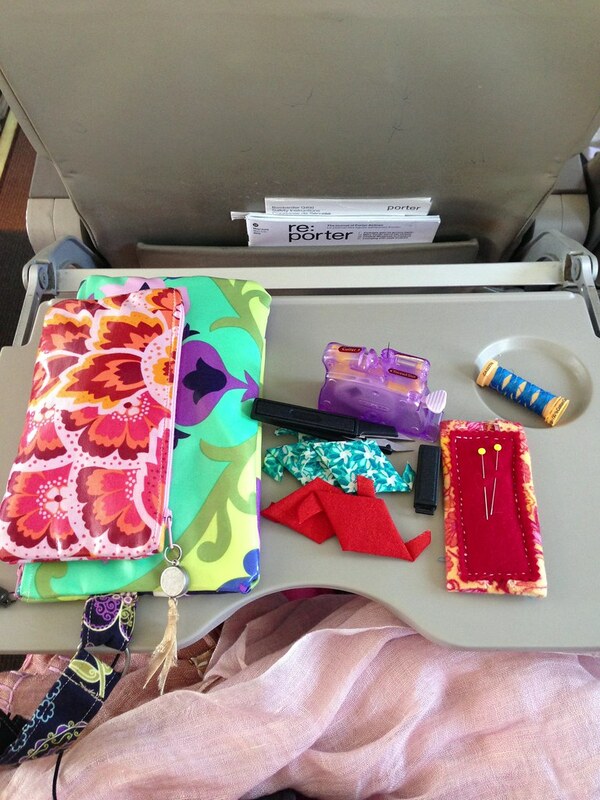 And then when we were delayed and they sent us to an airport in Shanghai, more sewing. Someone commented on the number of hours I was traveling to and back and said I should be able to make a WHOLE quilt with that much time. Didn't happen, but a great thing to keep my mind off the flying. I have only been quilting for a year or so and haven't yet gotten in to EPP, but this summer seems perfect for it - and that rose star is too beautiful not to try! Thanks for the chance to win. The book looks gorgeous. So far I've only tried hexagons. I made a gorgeous pillow outof Tilda fabrics that I really love! Thank you very much for the giveaway! I just jumped into EPP this winter and am taking it with me this week on a camping trip! I can't wait to have a completed project! I'd love this book -- I have no experience whatsoever with EPP, but I've been wanting to try for so long. Thanks for the giveaway! I have been looking for an on the go handwork project and this looks perfect! Thanks for the intro and the giveaway opportunity. Would love the book for inspiration - am in the middle of an EPP project and I would like to get going again with it!! Thank you! LOVE your quilts!!! I have a GFG started and enjoy working on it. You moms that blog, quilt, take care of children, house, etc. just AMAZE me!!! Very close to being done with a snowflake EPP quilt so I need some inspiration for my next project. This book looks like it would contain some lovlies to get me started! Thanks for the chance! I love EPP but need some motivation to start a project. It is the prep that always holds me back, once I get things organized I love it. 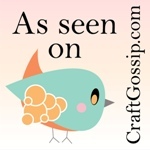 I love EPP, and I loved looking through your blogpost. So fantastic. Thanks for this giveaway! Thank you for the generous giveaway. I've only worked on hexagons and I really enjoy it. I have done some hexagon piecing and really enjoyed it. I have not ventured with any other shapes but look forward to trying more of it in the future. Would love this book as a learning tool. Mmm looks like a great! book! My grandmama did these, and I need to start. I'd love to win. Thanks! Oh my goodness what beautiful projects. I once tried a EPP project and lost it after hours of labor and never tried it again. But these fabulous projects sure makes me want to give it another go. Thanks for the chance to win Jessica's new book. I am a very new quilter. I started 20 years ago with a few simply 9 patched that were tied. I had not touched a sewing machine since. A great friend is a beautiful quilter so I decided I can do this too. So one year in and 4 completed quilts I am so in love! I am addicted to all of these wonderful blogs! Who knew! I love the videos, tutorials, and most of all the confessions! It give me confidence to try! I travel a lot so this book looks like a must try for me! :) Thank you for sharing! I began an EPP hexagon project last November when I won a small kit of 25 precut papers and 50 small fabric squares. I am HOOKED. I take my kit with me everywhere (I travel 4 days a week for work). I didn't have a plan in mind when I started (see "the Pelt" on Flickr): http://www.flickr.com/photos/24334738@N07/8912047471/ My next EPP project will have a plan, I think! 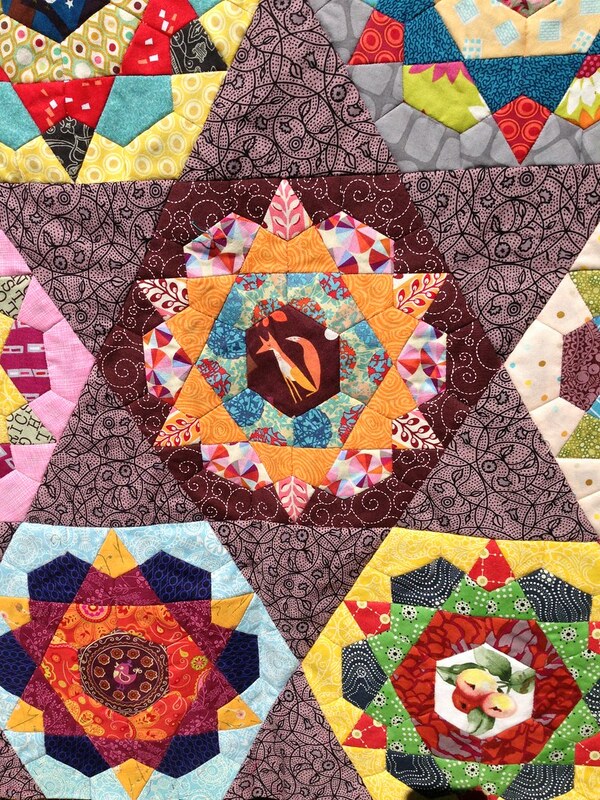 I had absolutely no desire to attempt an EPP quilt until I saw the beautiful quilts that others have made. Yours are stunning! 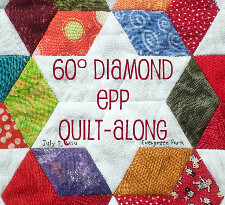 I would love to read about finishing the quilt edges with EPP. . .fingers crossed - thanks! I am just getting started with EPP. I am doing hexies to start with. I do enjoy it. I would love to win this book. Your EPP quilts are lovely! I need to go get mine out and dust it off to finish. Thanks for the chance to win! I have only done very little EPP, however I am taking a cross country trip and I am going to need something to keep me sane! 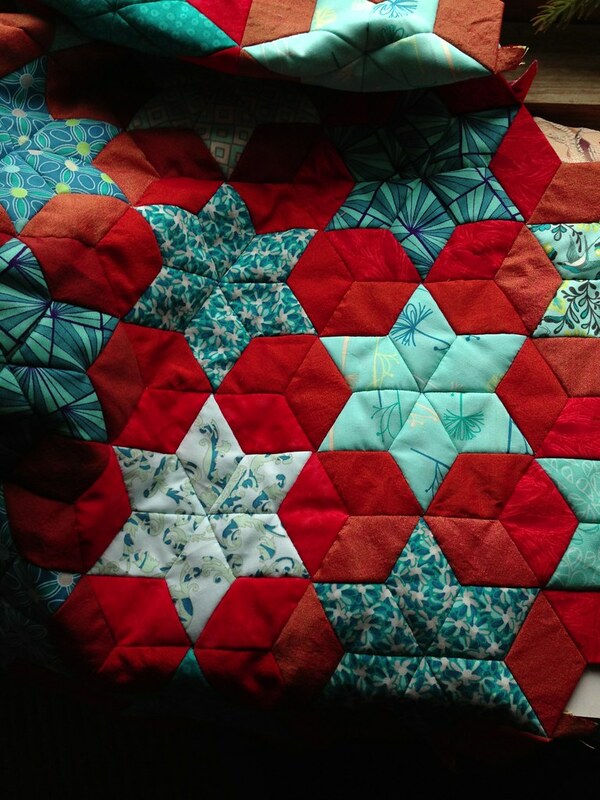 I have never tried EPP but would love to get started on a hexagon quilt. Wold love to win a copy of this book! I would love to win a copy of this book! Thanks so much for the opportunity. Beautiful quilt, thanks for the give away, can't wait to see the book. Beautiful quilts! I have been wanting to try EPP and am so close to doing it! This book would be the kick in the pants I need! I adore EPP. Hexagons are my favorite, but I haven't met a pattern yet that I haven't loved! Thanks for the giveaway! I have zero actual EPP experience, but I've read quite a bit and looked at lots of beautiful pictures! Thanks for the opportunity. I am an EPP virgin, but have been eyeing some hexies for a while now! Your quilt is beautiful. Thanks for the chance to win. I love to EPP and this book looks like a great book full of inspiration! Thanks for the giveaway.